The southern house spider (Figures 1 to 4), Kukulcania hibernalis (Hentz 1842), is a conspicuous arachnid in Florida due to its relatively large size and distinctive flat, tangled web. It is common throughout Florida and much of the southern United States in human populated areas. As a group, filistatid spiders are known as crevice spiders, and this species is sometimes referred to as the southern crevice spider. 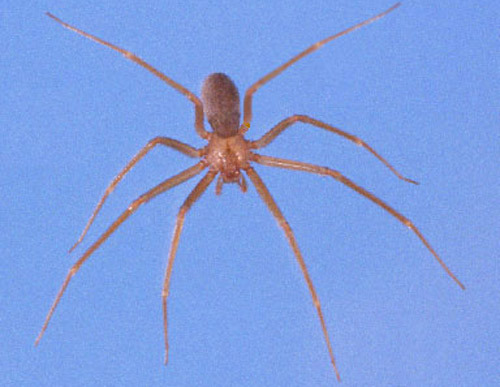 Males of this species are often mistaken for the notorious brown recluse spider, Loxosceles reclusa Gertsch and Mulaik, because of their color and general shape. Southern house spiders are not known to have a dangerous bite. However, two bite cases reportedly caused the victims pain and swelling for up to two days. Figure 1. Southern house spider, Kukulcania hibernalis Hentz. Photograph by Edward L. Manigault, Clemson University; www.insectimages.org. This species is common throughout Florida and much of the southern United States in human-populated areas. The southern house spider was described in the genus Filistata, but was later placed in the genus Kukulcania (Lehtinen 1967). The Filistatidae are related to a group of primitive Araneomorphae that collectively are known as Haplogynae. 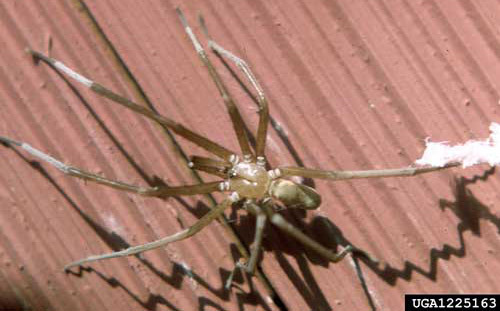 This group includes other spiders sometimes prone to occur in houses, such as the cellar spiders (Pholcidae), spitting spiders (Scytodidae), and the brown recluses and relatives (Sicariidae). Kukulcania hibernalis is a species that exhibits a great degree of sexual dimorphism. Females are charcoal gray and 13 to 19 mm in length. Females often have dusky patches on the carapace. The abdomen is elongate-ovoid, and at times can be considerably distended, e.g., after feeding or if the female is gravid. 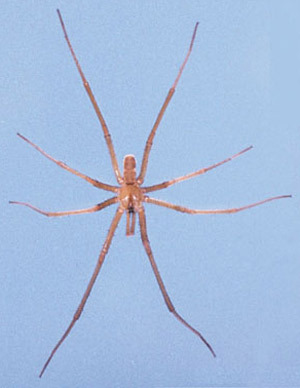 The male spider is 9 to 10 mm in length, khaki to amber in color and has long slender legs and palpi (the distal segments of the latter fold back along the proximal segments). Males also have a brown stripe from behind the eye prominence, which narrows quickly to include only the thoracic groove. The violin mark of the brown recluse is conspicuously wider and continues to the posterior edge of the carapace. Also, male Kukulcania hibernalis are generally larger than Loxosceles reclusa, have much longer legs and palpi, and have eight eyes grouped together on a raised prominence, rather than the six eyes in three pairs possessed by Loxosceles reclusa. Spiders in the family Filistatidae have structures called a cribellum (a silk-producing plate found anterior to the spinnerets) and a calamistrum (a row of specialized setae on the 4th metatarsus used for pulling silk from the cribellum). The silk has properties similar to velcro, in that it readily adheres to projections on other arthropods such as claws, setae, spines, and textured integument. When spun into sheets, it is an effective trap for insect prey. The male has these structures reduced or absent, as it does make a web in the adult stage. Figure 2. Lateral view of female southern house spider, Kukulcania hibernalis Hentz. Photograph by G. B. Edwards, Division of Plant Industry. Figure 3. Lateral view of male southern house spider, Kukulcania hibernalis Hentz, showing elongated palpi (arrow). Photograph by G. B. Edwards, Division of Plant Industry. Figure 4. Dorsal view of male southern house spider, Kukulcania hibernalis Hentz. Compare with the dorsal view of the female brown recluse spider, Loxosceles reclusa Gertsch and Mulaik. Photograph by Jeffrey Lotz, Division of Plant Industry. Figure 5. Female brown recluse spider, Loxosceles reclusa Gertsch and Mulaik, dorsal view for comparison with dorsal view of male southern house spider, Kukulcania hibernalis Hentz. Photograph by Jeffrey Lotz, Division of Plant Industry. The southern house spider is partial to spaces within the masonry of buildings; especially dark recesses of windowsills, shutters and overhangs. Females and juveniles make specialized webs (Figure 6) that are occasionally found under tree bark but are frequently seen on houses, barns, bridges, and other man-made structures. Here a spider seeks out a sheltered crevice for a nest, around which a distinctive web is made on the adjoining substrate. 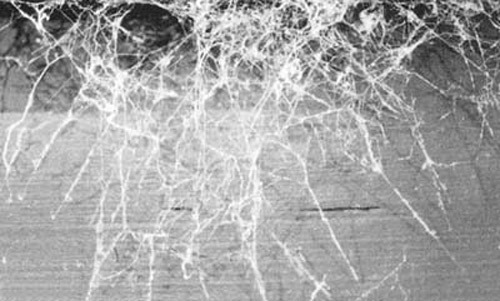 Under microscopic inspection, the silk of this web appears to be "woolly", an appearance created by the action of the calamistrum pulling silk from the cribellum. This web lacks sticky droplets which are characteristic of entrapment strands in webs of some other spider families. Rather, with Kukulcania hibernalis, the structure of the web itself is responsible for entangling prey. Males do not build webs but instead wander in search of females in order to mate. Females lay about 200 eggs that are loosely swathed in a silken ball about 15 mm in diameter and are kept with the female in her nest. In Florida, all stages of development seem to be present throughout the year. Females may live up to eight years (Kaston 1972). Figure 6. Web of the southern house spider, Kukulcania hibernalis Hentz. Photograph by G. B. Edwards, Division of Plant Industry. These spiders are generally found within their distinctive tangled web. During the day, they generally hide in the crevice from which the web emerges, but at night, they will come out and sit on the web. The webs have a decidedly unkempt appearance with debris and body parts of insect prey they have devoured. Small immatures can make webs in the crease between two adjoining surfaces, such as wall and ceiling, but larger individuals seem to need a more substantial shelter where they can retreat, hence their preference for holes and in crevices between boards or under fixed objects. Although the webs tend to accumulate debris and may be unsightly to some, this harmless spider is beneficial and captures many pest insects, including house flies, horse flies, mud daubers, cockroaches, and May beetles. The distinctive tangled, unkempt web easily identifies the presence of this spider. The eye protuberance, size and color of both sexes, and the long legs and palpi of the males aid in field identification. Wandering males are easily captured in shell vials; females must usually be trapped outside the nest on the web. Spiders are often in or around building because they prey on insects that are attracted to the lights. To prevent indoor spider infestations, cracks and crevices in window casings should be repaired, and spaces above and below doors should be sealed. Holes at entry points of water pipes and electrical lines should be plugged and screens should be kept securely on chimneys. The use of window and door screens (or repairing damaged screens) can also help reduce insect and subsequent spider invasions into the residence. Routine vacuuming can eliminate spiders over time by removing the food source. Periodic vacuuming along baseboards, under furniture, or other undisturbed areas near the floor of the home will remove webs, nests, and egg sacs. Firewood should be inspected for spiders or egg sacs before being brought into the house. In rare instances where spiders are numerous and constantly entering the house, you may wish to use an insecticide. These materials are best applied only where spiders are present. Hentz NM. 1842. Descriptions and figures of the Araneides of the United States. Boston Journal of Natural History 4: 223-231. Kaston BJ. 1972. How to Know the Spiders, 3rd edition. Wm. C. Brown, Co., Dubuque, Iowa. 272 pp. Lehtinen PT. 1967. Classification of the cribellate spiders and some allied families, with noted on the evolution of the suborder Araneomorpha. Annales Zoologici Fennici 4: 199-468. Levi HW. 1982. Araneae. pp. 77-95 In Parker SP. (ed.) Synopsis and Classification of Living Organisms, Vol. 2. McGraw-Hill Book Co., New York. Author: G.B. Edwards, Division of Plant Industry, and Kim McCanless, Entomology and Nematology Department, University of Florida. Publication Date: July 2000. Latest revision: December 2012. Reviewed: February 2019.